Compared to the previous year when Who’s Next was released followed by many tours of the US, The Who in 1972 were relatively inactive. Pete Townshend and John Entwistle worked on solo albums, and the band themselves released only two singles “Join Together” (with the b-side “Baby Don’t You Do It”) and “Relay” (with the b-side “Wasp Man”). Their only live appearances that year were a month long tour of Europe, beginning on August 11th, 1972 at the Festhalle in Frankfurt, Germany and ending on September 14th, 1972 at the Palasport in Rome, Italy. The 1972 set lists here did not differ much from those of the previous year, except for “Substitute” and “Amazing Journey” being dropped, the Tommy suite being shortened to two songs, “Long Live Rock” and “Relay” being added, and “Baby Don’t You Do It” and “Sparks” only appearing very few times. For the sound quality, Brussels is one of the best tapes from this short tour. It’s a fantastic stereo audience tape which, except for a bit of distortion in the higher frequencies, could have been one of the all time best Who tapes in circulation. There is a cut 1:43 in “Naked Eye” missing some music, but otherwise it presents the complete concert. Summertime Mods (Killing Floor KF-99028/29) was the first silver release of the tape in 2002. Brussels 1972 claim to use the master casette. It does sound slightly more clear than Killing Floor and is not as amplified, but there is minimal difference in sound quality between the two. “I Can’t Explain” opens the show. But instead of “Substitute” they play a short, compact version of “Shakin’ All Over.” It sounds out of place since it normally finds itself later in the show, but they give it a good effort. Roger Daltrey gives a short “MY WIFE” introduction to the next song, but Pete Townshend has to have a bit of silliness. “Watch this foot. This foot here” he jokes as Keith Moon accompanies him with an aggressive beat. With no visuals it’s hard know what he’s doing, probably indicating the boot John’s wife is going to give him. Many songs from Who’s Nextare played including “Behind Blue Eyes.” Townshend gives the introduction, telling Brussels “we haven’t been here since 1966. It’s still boring. The last time we were here we played in a tent. Was anybody here with us when we played in a tent. You?? Of course you were there” he jokes to someone in the front row. “Magic Bus” goes on forever with Townshend giving a schizophrenic performance in the middle. He goes from refined subtle country picking to noisy heavy metal riffage at the drop of a hat. Moon starts to introduce “Relay,” saying it is “played by synthesizer, played by the cheapest member of the band. The tape recorder. He doesn’t drink…A song from our fourth album. Which means you haven’t heard it yet. It’s called ‘The Relay.’” Their latest single is a bold move forward in their sound. The unusual but bombastic melody over the pounding rhythms makes it a superb live piece. “Pinball Wizard” segues into “See Me, Feel Me” for the shortest incarnation of Tommy yet. “My Generation,” which Townshend calls and “old decrepit, caveman rock and roll song” starts off the finale of the show. They get into the rarely played (for this tour) “Sparks,” sounding as if they need a bit more Tommy in the show. The band also get into a rare live rendition of “Wasp Man,” the b-side to “Relay.” A song written by Moon, Townshend plays the melody as Daltrey shouts out the lyrics. “Naked Eye” eventually segues into “Long Live Rock.” It serves as the set closer for these dates, but would eventually be dropped and brought back when the single would be re-released seven years later. They don’t extend the song past the studio recording, but Daltrey handles more of the singing than Townshend. 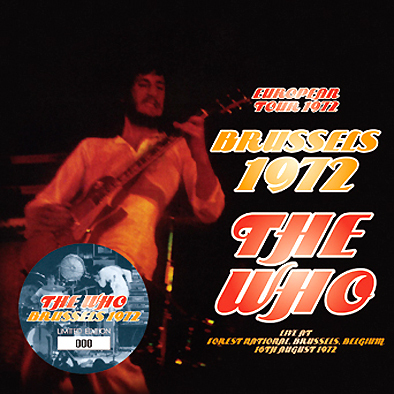 Brussels 1972 is a very good Who release. It comes from a poorly documented period in the band’s live period.